Looking to learn how to save money in the summer? Today's blog post is full of money saving tips for the summer months. School is almost out for children, and the weather is starting to warm up, which means the summer can be the most expensive time of the year for many people. Between paying for extra summer activities, daycare, vacations, higher electricity bills, and more, the summer means you may be spending more money than usual. For us, the summer months are actually some of our most affordable months. We are already fairly frugal people, but there are many things that happen in the summer that make it even more affordable for us, such as better weather for fun outdoor activities and free festivals to attend. 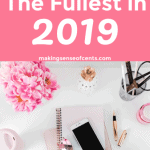 In today’s blog post, I am going to talk about the many different ways you can save money in the summer, so that you can truly enjoy the season without letting your spending get out of control. In many places, the summer can be a great time to enjoy the outdoors. But, even if you live in a place that gets very warm, by just waking up and getting outside a little bit earlier you can enjoy the outdoors before it heats up too much. Getting outside is always a great way to save money in the summer, no matter where you live. 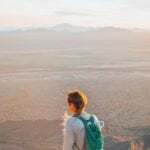 There are plenty of outdoor activities that you can enjoy, like going for a hike, setting out for a camping trip, walking your dog, riding your bike, going for a swim, going on a run, having a BBQ, and more! I’m the type of person who regularly combines all of my errands, no matter what the season is. If I need one thing, I will wait until there are more things on my to do list. This is good because it saves me valuable time, and I’m not wasting money on transportation. 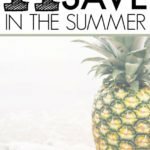 If you are looking for a way to save money in the summer, or even time, this may help. 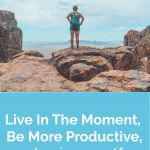 If something can wait, then you might as well save yourself some time and money by combining your errands and getting multiple things done at the same time. Ride your bike to do errands. If you have errands to run, you may want to ride your bike to complete them. This is a great way to save money in the summer because you can get in a good workout, enjoy the weather, and complete an errand all at the same time. So, strap some baskets on your bike or purchase a saddle bag and set out to complete your errands. While you may not be able to carry much, you'll be much more mindful of what you buy, while saving money on transportation. Remember though, always bring a bike lock so that your bike is safe! And, of course, wear a helmet and use any other safety precautions that you deem necessary. If you aren't using your gym membership, then you may want to think about canceling it and saving your money. There are many summer activities that can provide a great workout. And, if it’s too hot to get outside, you can still work out in your home for free. Plus, that AC you are already paying for will keep you cool! For some people there are positives to paying for a gym membership, but the majority of those with a gym membership do not get their money’s worth. Be flexible with your flights. Earn free budget vacations by using credit cards. I recommend reading this How To Take A 10 Day Trip To Hawaii For $22.40 – Flights & Accommodations Included. Stay in an Airbnb for budget travel. Ask for a discount at your hotel. Buy groceries and eat out less. Read more at How To Travel On A Budget And Still Have The Time Of Your Life. Turn your AC up a few degrees. The summer means it’s hot outside for most of us. I know this. But, you may be able to save a little on your utility bills by turning your AC up just a few degrees. I couldn’t find information about what the average person sets their thermostat at, but I always see social media posts about what people set their AC at during the summer. Many of the commenters say that their AC is set below 72 degrees and sometimes even as low as 65 degrees! To save money, I recommend setting your thermostat at 76 to 78 degrees when you are home. When you are going to sleep, or if no one is home, then you may even want to raise it a few degrees more. Our RV heats up quickly, so on hot days we make sure to block out the sun by closing all of the curtains. This keeps a lot of the heat out and helps our RV stay at a better temperature. It may sound like a simple thing, but blocking out the sun can really help if you are trying to figure out how to save money in the summer. You may want to shut the shades, close the curtains, close your front door, and more in order to block out the sun and contain the cool air conditioning. If you haven’t yet, a programmable thermostat is something you may want to invest in. They are relatively affordable and you will most likely make your money back within a year, maybe even just a few months. With a programmable thermostat, you can set exact temperatures for different times of the day. It automatically changes on a set schedule, meaning you won’t have to think about it. For example, your AC can automatically turn up when you leave for work so that you don’t waste electricity or money cooling a house that no one is in. You can also program it for while you are sleeping, for the weekend, when you are on vacation, and so on. Hot foods can make your house hot. It’s hot in the summer, I don’t have to say that twice. If it gets too hot where you live, you may want to be careful when it comes to what you cook for meals. Instead of using your oven for a lot of meals, you can try making something that won't heat up your home or cause you to sweat while cooking. Cooking meals in your slow cooker, your InstaPot, outside on the grill, and more can be great alternatives to using the oven. This can also help you save money in the summer because you won’t have to turn down the AC when the oven heats up your house. We haven’t used the oven a whole lot, and if we do, we make sure that it’s not scorching hot outside. After all, we live in an RV, so using the oven heats up our entire home. Instead, we try to use our slow cooker when it’s hot outside. I love a good crockpot meal because they are so easy to make. The average monthly cable bill is around $120. By the year 2020, the average cable bill is expected to be around $200 a month. Instead of paying for high cable bills, you may find it easy to save money in the summer by cutting your cable and heading outside for less expensive entertainment. The library can be a great way to catch a break from the heat (they are always so cold! ), while finding a good book to read or movie to watch. If you have trouble eating at home, then try the $5 Meal Plan. It’s only $5 a month, and you get meal plans emailed directly to you along with the exact shopping list you need in order to create the meals. This allows you to save time because you won’t have to meal plan anymore, and it will save you money as well! If you are interested in joining for free, click here. Learn more about weekly meal planning at The Power of Weekly Meal Planning. The summer means it’s garage sale and flea market season, so if you are looking for something to buy this summer, you may want to first search around at garage sales, flea markets, and more. This can also be a fun way to spend your morning while allowing you to save money in the summer on the things you need and want to buy. I have many friends who love going to garage sales and flea markets, and because things are so cheap, it may be worth it to you. Free fun is probably the best way to save money in the summer. I recommend checking out your town’s calendar and website to see what free attractions and events are offered. In many towns, there may be free festivals, free concerts, and more. Also, if you live near a national park, you may want to find out when their free entry days are. They usually have a few each year, which can be a great way to save money while enjoying amazing views. The free entry days for 2017 are August 25, September 30, and November 11-12th. How are you saving money in the summer? Do the summer months tend to be expensive for you or not? So we try to take advantage as much as possible. When it comes to travel we actually try not to travel during the summer months. We like the shoulder seasons of April/May and Sept/Oct. 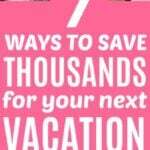 We found that you can save a ton of money on flights and hotels plus not having to worry about the summer crush from kids out of school. With our son, we try to shop at second hand stores from time to time. He’s an active 19-month-old, so he’s dirtying up his clothes all the time. Makes no sense to buy brand new. Plus, he’s growing like a weed. God love him. I’ll have to try that AC tip. We set ours in the high 60s, low 70s. It just gets so hot with all the commotion at home. But, I’ll have to give it a shot. One thing we have done is get a small AC unit for the bedroom. We turn on the home one and just use that one at night. Makes a world of difference and doesn’t cost as much. These are all great ideas. 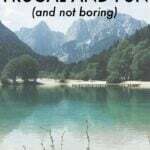 Camping and being outdoors is one of my favorite frugal activities in the summer. One I’d like to add is starting a garden. Even something as simple as a pot with some fresh herbs. Gardens are fun, frugal, and delicious. A perfect summer activity. We’ve got tomatoes, peppers, lettuce, arugula, spinach, green beans and a bunch of herbs in our garden. Awesome stuff to add to a summer BBQ. Great list! My kids love the library. We will probably be there a lot this summer. The library has lots of activities and interactive story time! I agree with many of these but the A/C one is a little tough. First, 76-78 is pretty stuffy and the system doesn’t run enough to remove enough of the humidity that the A/C typically helps with. Also, we actually set ours a degree or two lower at night, otherwise it won’t run at all. $5-10 more a month is well worth actually being able to sleep! I turn up the thermostat. Eventually, I’ll have an energy efficient house, but as of right now, I don’t have the most energy efficient windows. In Germany nearly nobody owns an AC. Solar panels would be perfect to run AC. When the sun is high, the most current is produced. How hot does it get there? Just wondering, there are many places in the US that don’t have ACs either. When we go somewhere fun for the day, I make sure to pack a cooler with drinks, snacks, and maybe a picnic. That way we don’t have to spend money on food. Great article Michelle! I think there are local government issued rebates on programmable thermostats. My husband got a NEST (usually $200) on sale + rebate for $50. Total steal! 😀 We’re from Seattle. Check with your county for rebate programs! Great tip on canceling cable for the summer! In fact, with so many low cost subscription services now like Netflix, Hulu, and Amazon Prime, you may not even need cable anymore! My husband and I have gone without for over a year now, and honestly don’t even miss it! Yep, we don’t miss it at all! Great list! Summertime can be the best, but also expensive. We live in our camper and struggle with keeping it cool, we are in MS for my hubbys job so it is so hot. Any tips or tricks for keeping the camper cooler? I feel like our ac isn’t very good. We just move the RV when it gets too hot because RVs usually can’t handle super hot weather. That makes it hard for more stationary people like you – can you park under some shade? We love looking at maps of local city parks and having picnics! We can usually make sandwiches cheap and our 15 months old lovers being outside! We have also found so many free festivals and museums in the summer. We can walk through the free museum and steal their AC if we need to! Camping is also a wonderful vacation idea that can be done so cheap! It could be easy to find a barely used tent at a garage sale and find a great state park to enjoy a weekend in. I have so many camping memories that I am cost very little since we ate basically hot dogs and fruit all weekend. Free fun is the best. There are a lot of free things to do in Atlanta. I could go out every weekend if I wanted to. Great article just in time for summer! Someone has mentioned that Germany has no AC, which is true. I was born and brought up in Germany. It does get hot during the summer, 90s easily, and we cooled down by opening lots of windows to create cross breezes as well as used fans. Germans would not spend their hard earned cash on electricity for air conditioners. Or dryers for that matter. Interesting! There are many places in the US that are the same way. I’m from St. Louis and everyone has AC – it just gets way too hot and humid there to not have it haha. Great list! I always try to plan out my errands efficiently so I’m not back tracking or wasting time. Your ideas for saving money in summer were really great. Great not only in the sense of saving money, but also the best way to enjo the super with less expenses. Me and my friend always start to go Library. We will probably be there a lot this summer. The library has lots of activities and interactive story time! J.D. and I are trying to get better at meal planning. We eat like poor people (lots of beans and rice) but we also love making Korean food at home, which can get pretty expensive! Couldn’t agree more with these tips! I love the free summer activities! I have recently started shopping second hand as well. Thanks for the extra tips! One way I save money is buying my supplies for the summer in bulk so I won’t be needing to go out to get them. I buy things like extra shampoo and conditioner at bed Bath and beyond using their coupons and buying my toiletries for travel too. I also look up free printable for scavenger hunts since I live next door to a park to do. I live in a state with a $0.05 deposit on cans and bottles so I cash them in and save up for movie tickets and the like. I print out free coloring pages and do chores around the house to be productive. I mostly stay home during the summer.